Mariano Barbacid, Ph.D., former Head, Developmental Oncology Section, Basic Research Program, National Cancer Institute. 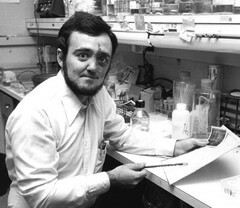 Best known as one of three researchers who first isolated a human oncogene, H-Ras. Ras oncogenes have now been implicated in approximately one-fifth of all human cancers. Dr. Barbacid conducted most of his research in the United States until 1998 when he returned to his native Spain to establish the new Centro Nacional de Investigaciones Oncológicas (Spanish National Cancer Research Center), where he served as its first director until 2011.